Happy Birthday Akshay Kumar: Twinkle Khanna’s birthday wish for hubby is too adorable to miss! Bollywood actor Akshay Kumar has turned 51 today and wifey Twinkle Khanna has come with something really special for her love. Twinkle recently took to her Twitter handle and shared a lovely message for Akshay. The couple Twinkle and Akshay Kumar hosted a family dinner with the close friends. The close friends included Bobby Deol and his wife Tanya Deol. Check out all the details. Bollywood actor Akshay Kumar is ringing in his 51st birthday and wifey Twinkle Khanna has the sweetest wish for her hubby. Sharing a photograph on Instagram, Twinkle Khanna has poured out her heart while wishing Akshay a Happy Birthday. 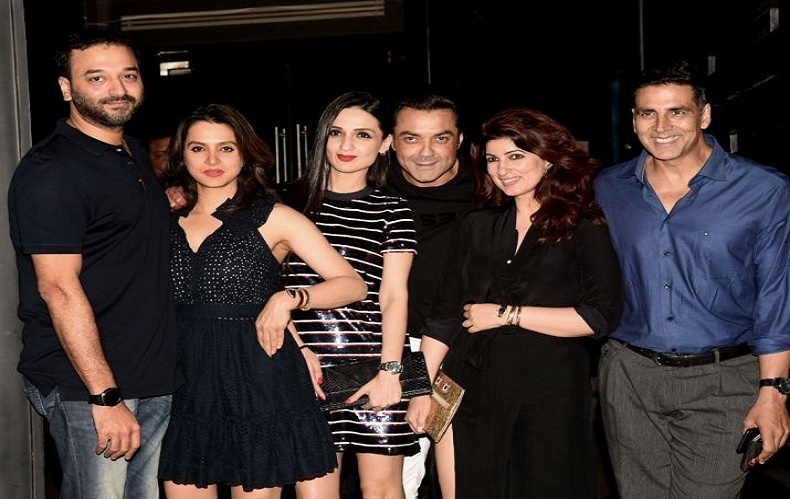 She wrote that sometimes when you don’t plan things – it all falls in place – Happy Birthday to my love Mr K. In the photo, the couple can be seen posing for the camera with their close friends including Bobby Deol and his wife Tanya Deol. Recently, Ranveer Singh, Sonam Kapoor, Karan Johar, Sonam Kapoor and Dimple Kapadia attended the book launch of Twinkle Khanna’s ‘Pyjamas are Forgiving’. Not many know about a love story behind the Akshay Kumar and Twinkle Khanna. In an interview to a leading daily, Akshay Kumar confessed that the two first met during a photo shoot for Filmfare magazine, in Mumbai. Thereafter meeting Akshay, he developed an instant crush on Twinkle. But the duo fell for each other during the shooting of their film, ‘International Khiladi’. The duo got married on January 7, 2001, at Abu Jani and Sandeep Khosla’s residence in a private ceremony. It was attended by Aamir Khan, politician- Amar Singh, renowned director- Dharmesh Darshan. It took time for them to digest that the duo is getting married finally. On the professional front, Akshay was last seen in Reema Kagti’s Gold with Mouni Roy. He will next appear in Rajinikanth starrer 2.0. Not just it, Akshay is currently shooting for the multi-starrer Housefull 4.